The Bible teaches that a man is saved by the grace of God, through faith in the finished work of Christ and not by his own works. The Bible teaches that man is inherently sinful and evil from birth. Without the grace of God, a man is unable to seek righteousness. No one is good but God. Only through Christ can men be empowered to do good works in the eyes of God. The Message of Freemasonry is “Making Good Men Better” (Masonic Messenger, April 2014). Freemasons seek to use the tenets of Freemasonry to build their own spiritual temple, to make themselves better through the practice of Freemasonry. Freemasonry teaches that men who don’t know Jesus can make themselves better. The Bible teaches that people should not mix false religion with the true religion of God. The Ten Commandments require that man have no other gods before Yahweh and that man make no graven images. The officers of a New Testament Church are pastors and deacons. There is one high priest, Jesus, who is mediator between God and men. God is a jealous God. It is not acceptable before God to practice Christianity and another religion. Christ and His church are to be held in the highest esteem. Masonry teaches that one may become a high priest by advancing through the degrees of Masonry. Doyle Franklin Williams was a member of the first Baptist Church of Emerson, Georgia where he was a deacon and the Music Director. He was also a member of Emerson Masonic Lodge #738 where he served as the Worshipful Master. He also served as the “High Priest” of Cartersville Royal Arch #144. 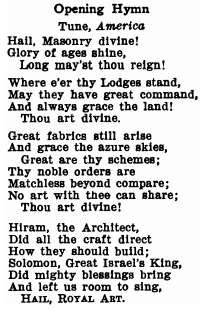 In Freemasonry, there are hymns of praise to the lodge and Freemasonry is considered the highest institution on Earth. The Lodge is to be held in the highest esteem. Freemasonry encourages syncretism. For more information on Freemasonry, contact us.